Globe is pleased to welcome Dwane Fitzgerald as our new courier in our messenger division. 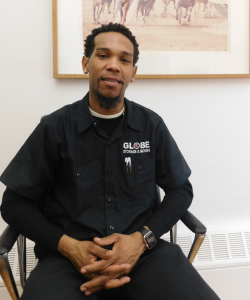 Prior to being hired by Globe, Dwane has been a member of Teamster Local 814 since December 2012. In this time, he has worked with the Globe team on many projects, including commercial moves for clients like Christies Auction house and Goldman Sachs. We are happy to announce this new addition to our team, in order to ensure that storage deliveries are made to our clients in a safe and timely manner.